On this page we have vintage baby nursery ideas with fabrics and decor that are as soft and sweet as the petal of an heirloom rose. The photos that our visitors share have creative, often homemade, decorative touches that will remind you of days gone by. Take a trip down memory lane with us into the process of decorating vintage style nursery decor that is a charming blend of antiques and baby bedding found in the stores right now. We have many lovely pictures with stunning examples of vintage nurseries and decor including a photo shared by Rachel of "A Little Bit Vintage". We appreciate that Rachel has not only allowed us to admire her daughter's beautiful bedroom, but has given us some clues as to how she pulled it all together so nicely. And this is just one of several photos shared by real moms that are sure to inspire you. 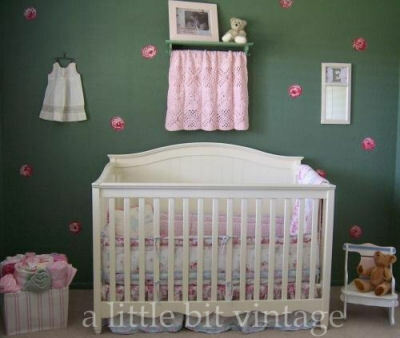 Vintage Girl Nursery decorated with flea market treasures. 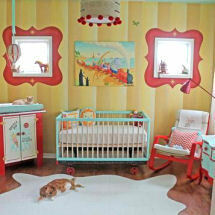 This picture is of our daughter's shabby chic, vintage baby nursery that I designed. My goal was to create a room that refected our love of vintage style. As you can see, the space is an eclectic blend of vintage flea market and antique store finds as well as items that I bought new. crib sets, curtains and items in lovely vintage fabrics. A staple in old-fashioned nurseries is antique white or ivory crib and rose crib bedding and large wicker basket that can be used as storage for blankets or toys. Greige, a color that features gray and beige undertones is an excellent choice for the nursery wall color because it has a soft, aged look. Nursery furniture might include a rocking chair that one of the baby's ancestors made and used many years ago. Items found at thrift stores and garage sales such as vintage toys used as decorations for the nursery might be displayed on shelves or in recycled hutches and armoires. If your treasures look "too new" they can be painted and distressed. Antique baby dresses and christening gowns can be enjoyed and protected in shadowboxes with glass fronts. If you haven't been blessed with family pieces simply visit your local antique store or go to estate sales. Repurposed mirrors and picture frames are right at home in a vintage baby nursery theme. To give them a custom look, either replace the mirror with a photo or personalize the piece with the baby's name or initial made out of scrapbook paper placed in the center. Consider painting shabby pink roses on the furniture or the wall that closely match the roses in the baby's nursery bedding set. Please use the form provided for your convenience on this page to share pictures of your vintage baby nursery decor to give parents interested in this theme a starting point for their own Unique Baby Gear Ideas. Do you have a great set of baby bedding or a picture of a nursery that you decorated vintage style or theme? Share it!